Can we talk about the Reigning Mother of God icon that was uncovered in Russia in 1917? Are you guys saying it's not canonical? I know of a Russian parish that is named after it. As far as I can tell, only one person, of dubious authority, is saying that. isn't everyone here of dubious authority? Its the internet. True, but not everyone here self-promotes as an expert. Based on the amount of arguing that happens over every single pinpoint of info, I would disagree with this statement. I am an oc.net expert. There is nothing that escapes my unwavering eye. ^^ the letters are to small, I sppose they're Aaron and Abraham? Very interesting, however I'm afraid it may be schlock. BTW, I propose to create a separate topic about icons with embraces, kissing etc. as it will make this thread "cleaner". It's Moses and Aaron. And the icon is called "The Cloud of Witness." The icon appears to say "The Tabernacle Witness." The icon depicting a gent looking at a crow (sorry, I am recovering from arthristis procedures) - is tjat canonical? Last time I checked St. Elijah was canonical. I think that's St. Elias (Elijah). If memory serves me, there was a story that a crow came to feed him in the desert. Yeah, it's a pretty common way to depict St. Elias. St Elias being fed by a raven is straight from scripture so I don't imagine anyone would question its legitimacy as an image. I think talking about "canonical" icons is misleading because canons governing the actual content of icons are very sparse. In fact I believe there is only one such canon- Trullo 82, which prohibits depicting Christ as a lamb. That leaves us with comparing the content of icons to scripture, hagiography, hymnography, etc. which gives quite a bit of leeway in some respects. There is also the general theology of icons as outlined by Nicaea II and the fathers but again they do not lay down precise rules of iconography. Oftentimes, when someone is talking about "canonical" or "non-canonical" iconography he is doing so with a set of rules in mind that have been fabricated with the assumption that Byzantine = Orthodox. Oh whoops! Yes, that's what I meant. The reason I asked whether it was canonical was not the content, but rather the realism of his face and the rocks, and the odd colour scheme. I had forgotten about St. Elias being fed by a crow, but remember that now (St. Paul the Hermit was fed the same way). Looks to me like it's just done in relief. Good. That makes me happy, because I thought it was a beautiful icon. Which canons provide rulings about "realism" or color schemes? Christ the Holy Silence - is it canonical? I'm confused by the symbolism of that bottom one. 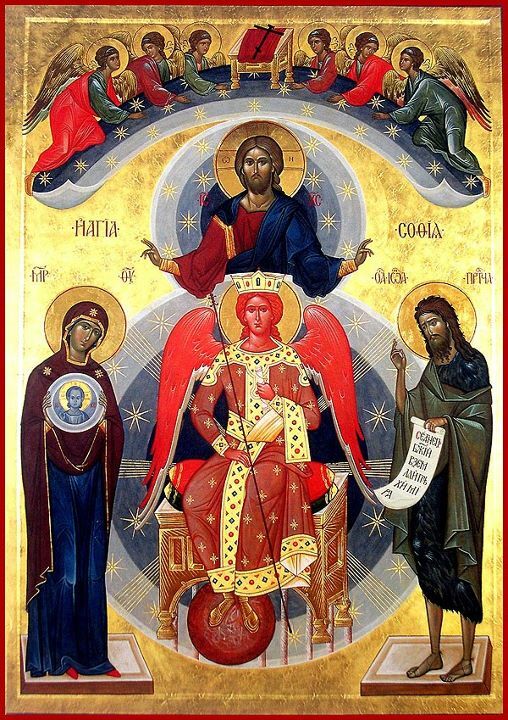 What is the Theotokos holding and who is red and seated in the chair with wings? EDIT: I suppose this answers my questions. The first icon, is acceptable, and it's personally one of my favorites. I believe it's called "Unfading Bloom," and is based on a hymn, but I may be wrong about the last past. The second, however, is not. This is because it portrays Christ in a way that fails to express His humanity as well as His divinity. The reason we can have icons at all is because God became man, so it is contradictory to not portray Him as such. 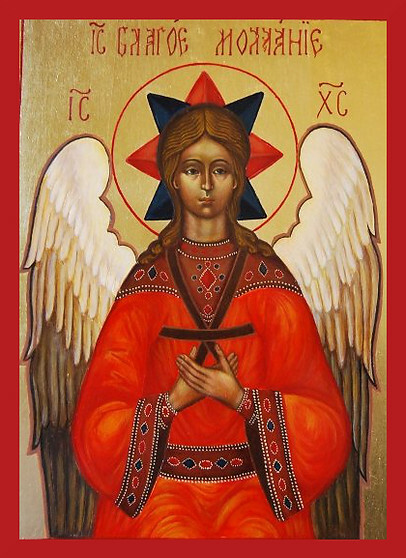 Ironically, that link actually gave the description of this icon, also called "Holy Wisdom." Uncommon, perhaps, but neither strange, nor schlock. 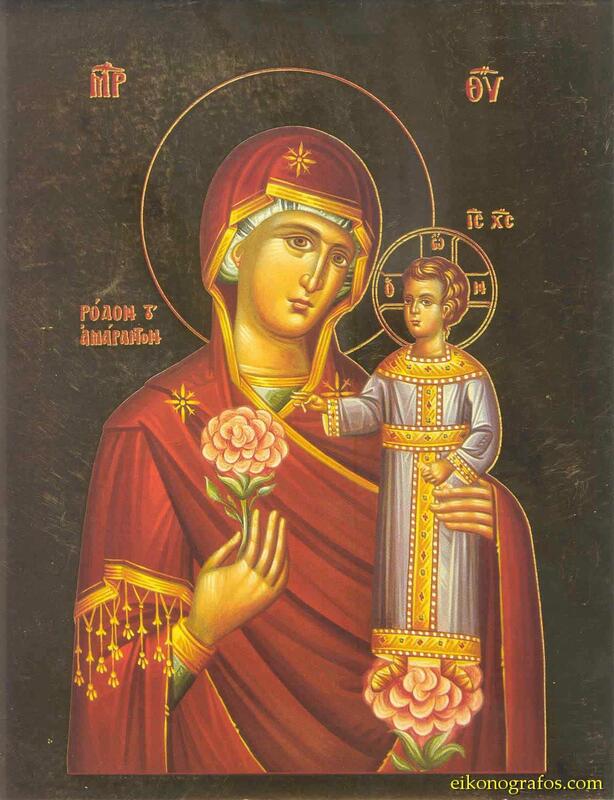 This icon is called The Unfading Rose (Rhodon to Amaranton in Greek). This description refers to the Mother of God, and can be found among the many expressions of praise and exaltation to her in the Akathist Hymn, and in some Theotokia. There are other icons of the Mother of God with titles of other descriptive expressions found in hymns and prayers to her. There is also a lovely tradition concerning her Dormition, that when the Apostle Thomas arrived three days later to pay his respects at her grave (he was not present when the other apostles had gathered at her deathbed), he entered her tomb in sorrow, not only over her death, but also that he had missed out in being by her side with the other apostles at her final hour and her burial. Her body was gone, but the tomb was filled with fragrant roses. The rose has since ancient times been known as the Queen of Flowers. It is a fitting symbol of the Mother of God as Queen, and of her true beauty, and of her bringing forth God Incarnate unharmed. Roses bloom among thorns. Thank you, Hayden, you beat me to it. This image is yet another variant of the Christ Holy Wisdom imagery, repeatedly denounced over the centuries as unfit for veneration. That image is completely unsuitable for veneration. Orthodoxy teaches that Christ is the Wisdom of God, not His Mother. Yes, of course. Neither Holy Wisdom is correct. The link that Trisagion posted, however, described the version above, not the one Dominika posted. "The pine tree rose is the way, the truth and the life" is what this painting is saying. Yeah, when you make up rules as you go along, that happens from time to time. But she's only holding the rose, not pointing to it. That's my understanding. She was also holding the pine tree. But she wasn't pointing to it. LBK can explain it better than I, but there is a difference. The Theotokos only points to salvation (i.e. 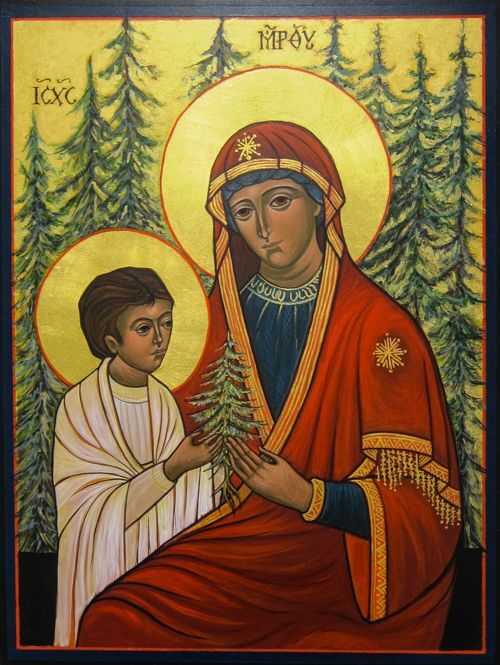 Christ), but she is allowed to hold whatever the iconographer wants her to hold, within reason. There's a great deal of theology behind it, which I cannot explain, or at least not well enough to post it to an online forum. I sure don't make up the rules as I'm going along. But by that same measure, isn't Jesus pointing to the rose? His thumb might be, but the other three fingers seem to be aimed too high; if anything, they're pointing at the star on the Theotokos' right shoulder. Christ is not pointing to the rose. He's blessing His Mother. An explanation of this would be appreciated. All of your contrived, nit-picky icon rules make icon veneration no holier than evaluating the worth of baseball cards. Icons are nothing less than the visual, pictorial expression of what the Church teaches, proclaims and believes, just as hymns and prayers are the verbal expression. I'm sorry if my adherence to appropriate standards of this expression offends you. You never cite your sources for why your standards are the definitive ones. Icons are depictions based on a particular theological understanding of Christ, the Mother of God and the saints. Icons are not just general depictions of them or of an episode of divine dispensation. Rather, icons are depicted with specific theological intention; and it is this which governs the way in which they are depicted. This is what makes them icons. Iconography is not just religious or spiritual depiction, but is based on a theological depiction which the canonical rule, such as the well-known Canon 82 of the Quinisext council, points to. It, and the Seventh Council which followed it, along with the iconoclastic controversy and the theological issues pertinent to it, has profoundly influenced on our sense of what iconography is. 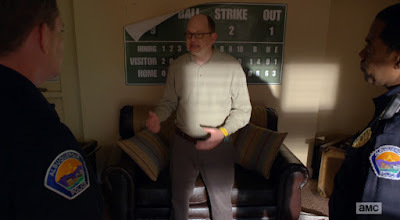 But what this understanding has done for us is to provide us, not with simply a rule that certain representational depictions are not permitted, but that iconography needs to follow a particular canonical understanding. I agree, in part. Icons displayed in the church and venerated as icons should be approved bybthe ecclesiastical authorities. An iconographer should, I think, within the mind of the Church, be able to propose a new icon, and even paint a prototype, or sketch a prototype, but without episcopal approval, these icons are formally Orthodoc iconography; they are religious artwork. I regard the frescoes of Michaelangelo in the Sistine Chapel for example as exquisitely beautiful religious artwork. However, they are essentially decoration; sublime decoration, but decoration nonetheless. They should be appreciated and admired, but not venerated as a faithful representation of our Lord or the saints. I believe it is not entirely inappropriate for Orthodox churches to contain such decoration, provided it is clearly differentiated from the proper icons. However, in an Orthodox parish, I think it is better to keep all of the decoration in accord with canonical norms and iconographic tradition. This doesn't have to be Byzantine iconographic tradition; whereas an EO parish positively cannot have even as a decoration an image depicting Christ as a lamb owing to the canons of the Qunisext Council, the ore-schism Roman Catholic Church rejected Trullo, and as a result, I believe Western Rite Orthodox parishes should be allowed to have such images, to the extent that they ought to try to represent the state of the Roman Catholic Church before the Great Schism, during the Iconoclastic Persecution, when it supported the iconodules (its finest hour, I think). Traditional Roman icons look much like traditional Eastern and Oriental icons; they are stylized, with limited bas relief; they tend to take the form of stained glass windows. This I like by the way. I wish we had more iconographic stained glass windows in Orthodoxy, rather than the abstract patterns one usually encounters. Note thisnis my personal opinion on the matter; I speak with no personal authority on this matter and have never discussed icons in depth with my spiritual father. whereas an EO parish positively cannot have even as a decoration an image depicting Christ as a lamb owing to the canons of the Qunisext Council, the ore-schism Roman Catholic Church rejected Trullo, and as a result, I believe Western Rite Orthodox parishes should be allowed to have such images, to the extent that they ought to try to represent the state of the Roman Catholic Church before the Great Schism, during the Iconoclastic Persecution, when it supported the iconodules (its finest hour, I think). You're putting "culture" over theology and Orthodoxy. Style over substance. Allowing any Orthodox, including WRO, to paint Christ as a lamb, is expressly forbidden by Canon 82. Period. Adherents of the WR church insist it is fully Orthodox. This means the complete acceptance of the Quinisext Council by the WRO, just as the eastern-rite Church accepts it.